Oktoberfest is almost here. Here's where you can celebrate. Lift your steins and give thanks — Oktoberfest is almost upon us. The Munich folk festival traditionally runs for 16 to 18 days, but here in New York City you can find events throughout September and October. Get an early jump on the Oktoberfest festivities at this Upper East Side beer hall. A variety of German beers will be on tap, and ambitious revelers can work their way through them to fill a special passport. There will also be a beer stein hoisting competition with prizes awarded to the winners. The bar will be celebrating Oktoberfest through Oct. 14. When: 12 to 3 p.m.
Watch the parade that celebrates "over three centuries of German-American friendship" and marks the start of Oktoberfest in New York City. Spectators can expect to hear bands and watch dance groups in traditional costumes. $15 grandstand tickets are also available if you want an unobstructed view. When: 1:30 to 7:30 p.m.
Kickoff the Oktoberfest celebrations with this annual tradition. The festival will exclusively serve German brews while you listen to the Polka Brothers and other bands. 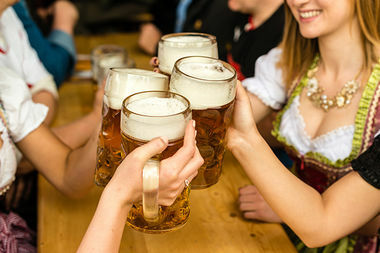 If you're feeling strong that day you can enter yourself into the eighth annual National Masskrugstemmen Championship, in which competitors see who can hold a full beer stein at arms' length the longest. Tickets to the event are $30. When: 12 p.m. to 4 a.m.
Come enjoy Oktoberfest specials all day and night along with a ceremonial keg tapping of Hofbrau Oktoberfest at 2 p.m. There will also be a free pig roast at 4 p.m. Large groups and pub crawls are welcome. When: 12 p.m. to 12 a.m. This Oktoberfest party promises to bring Munich to New York. Revelers can enjoy their steins of beer with live music, traditional food and family fun. The event is free but you can reserve tickets. When: All day; Bratwurst Boys Band shows from 3 to 6 p.m. and 8 to 11 p.m. This beer hall promises a festive atmosphere with servers and bartenders in traditional dirndl and lederhosen. You can get a some authentic German cuisine to go with your litre of German beer. Then kick back while listening to the Bratwurst Boys Band who will be playing two shows that day. The Biergarten is kicking off the celebrations with a live performance from the German orchestra band Die Spitzbaum. The festivities will include beer, food, games and more. Catch the Bavarski Band perform while chowing down on schnitzels and wurst at Midtown's version of a Bavarian Bier Halle. When: 5:40 to 11 p.m. Enjoy a pre-game Oktoberfest party in the Bullpen Plaza at Citi Field before the Mets take on the Philadelphia Phillies. Attendees will receive a limited-edition Mets Oktoberfest gift. For more information about ticketing, click here. Listen to the Melina Sings Band while chowing down on schnitzels and wurst at Reichenbach Hall, which promises to be the biggest and "most bona-fide" German beer hall in NYC. When: Check-in at 11 p.m.; boarding begins at 11:45 p.m.; return is approximately 4 a.m. If your idea of Oktoberfest is partying on a boat, this is the event for you. Two DJs will play this three-level party boat with guests dressed to impress. Tickets must be purchased in advance and start at $26.75. Try seven different German beers paired with a three-course German dinner with beer expert Rudi Eilers. The dinner includes a seasonal salad, three kinds of German sausages with mashed potatoes and beer-marinated sauerkraut, as well as a Black Forest cake soaked in cherry schnapps. Tickets are $55 per person, and you must be at least 21 to participate. When: Oct. 6 and 7, 6 to 10 p.m.; Oct. 8, 3 to 10 p.m. The Manhattan Bridge Archway is being transformed into a beer hall for the first time. The event put on by the DUMBO Business Improvement District will feature musical performances, crafts, themed foods and of course beer. There will be traditional tunes from Melina and the Oompahs, and on Oct. 7 and 8 DJ Holzmeister will be spinning everything from traditional Bavarian music to German pop songs. More information about specific dates and times can be found here.